Igor Rychlik and Mao Wengang (Anastassia, Anders, Cedric, Gauthe, Jonas, Krys, Pierre, Sofia, Richard) University of Gothenburg Chalmers Institute of Technology. 2 Cracks observed after one year of exploitation. 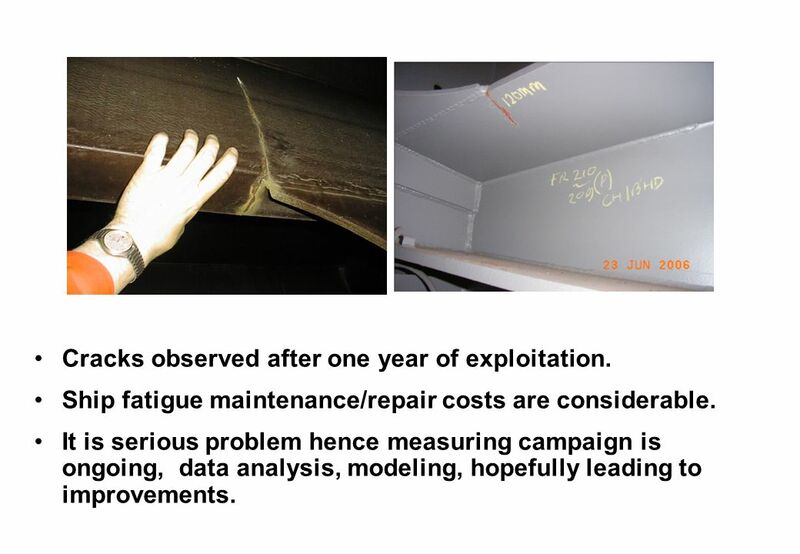 Ship fatigue maintenance/repair costs are considerable. 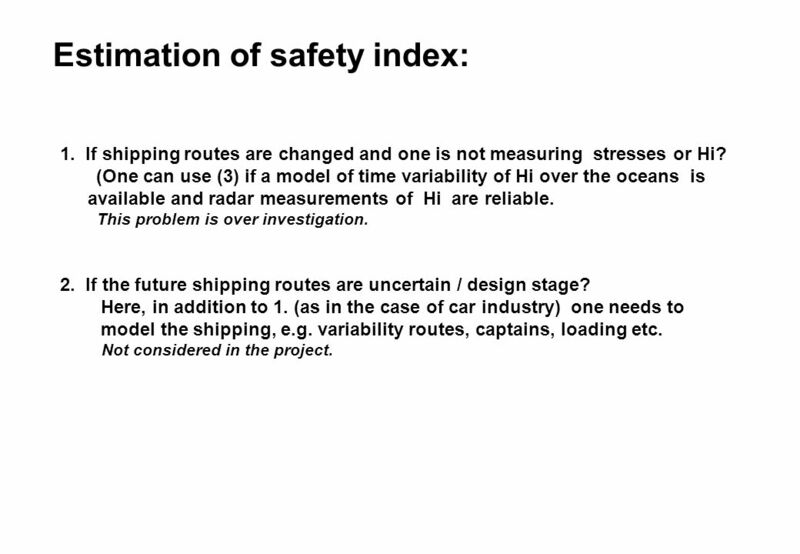 It is serious problem hence measuring campaign is ongoing, data analysis, modeling, hopefully leading to improvements. 5 A stress x is ”safe” for fatigue if for some r.v. 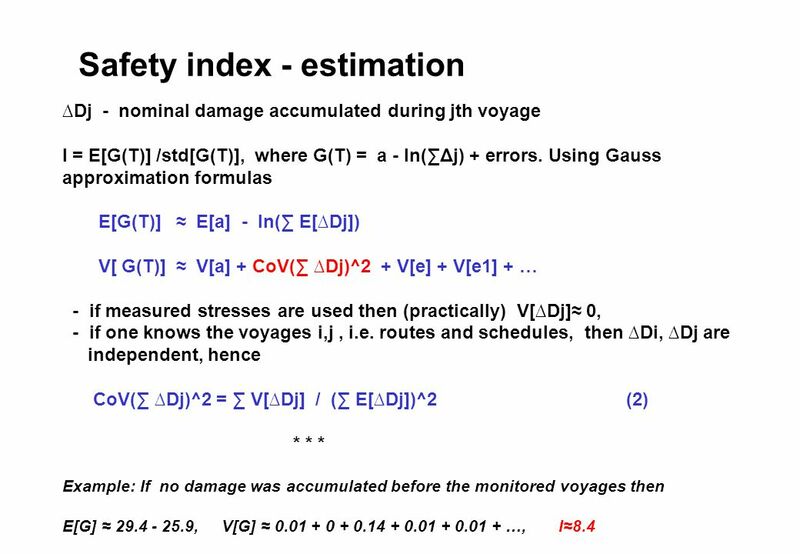 G>0 and “unsafe” if G<0, then define I = E[G] / std[G] to be a safety index for fatigue failure. Properties: - G is not uniquely defined. - if G ≈ Normal then Pf ≈ Φ( - I ). 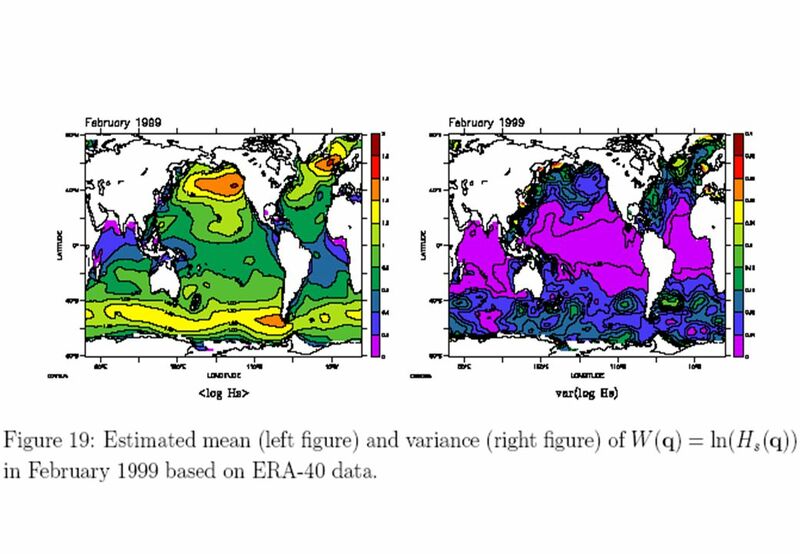 * * * Motivated by (1) we choose G(T) = a - ln(D(T)) + e + e1 + e2 + e3 + …, ei are different types of uncertainties/ errors. 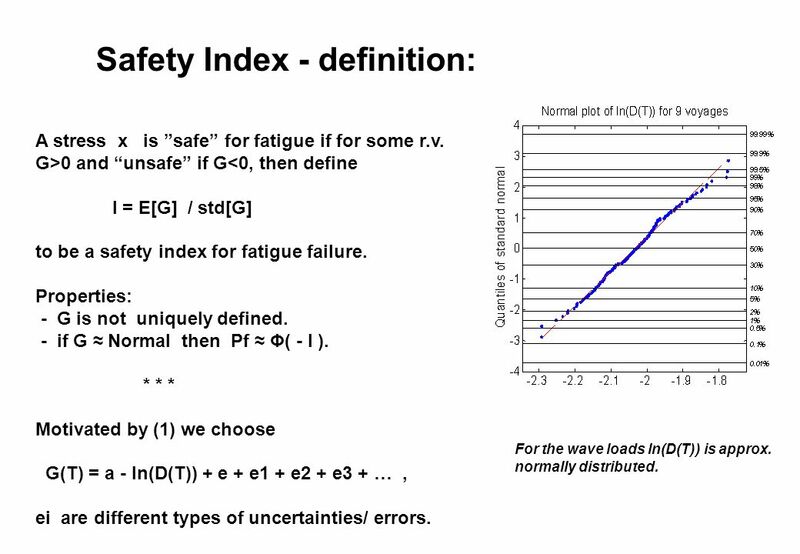 Safety Index - definition: For the wave loads ln(D(T)) is approx. normally distributed. 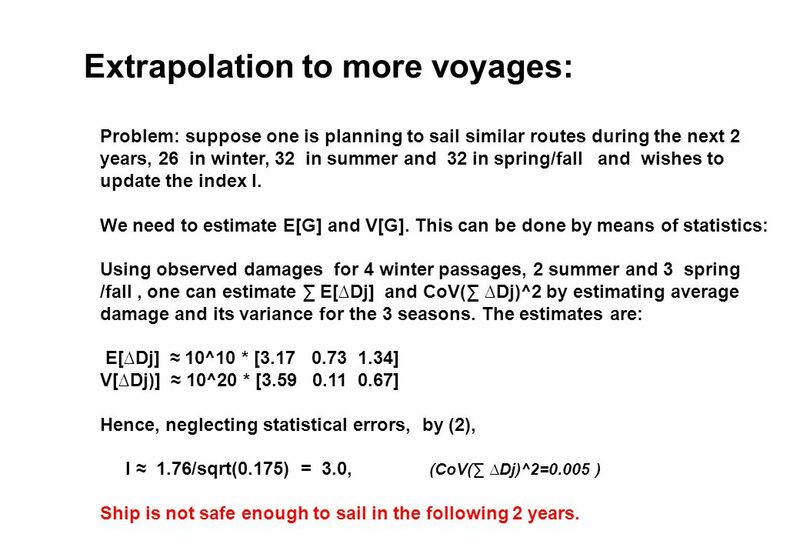 7 Extrapolation to more voyages: Problem: suppose one is planning to sail similar routes during the next 2 years, 26 in winter, 32 in summer and 32 in spring/fall and wishes to update the index I. We need to estimate E[G] and V[G]. 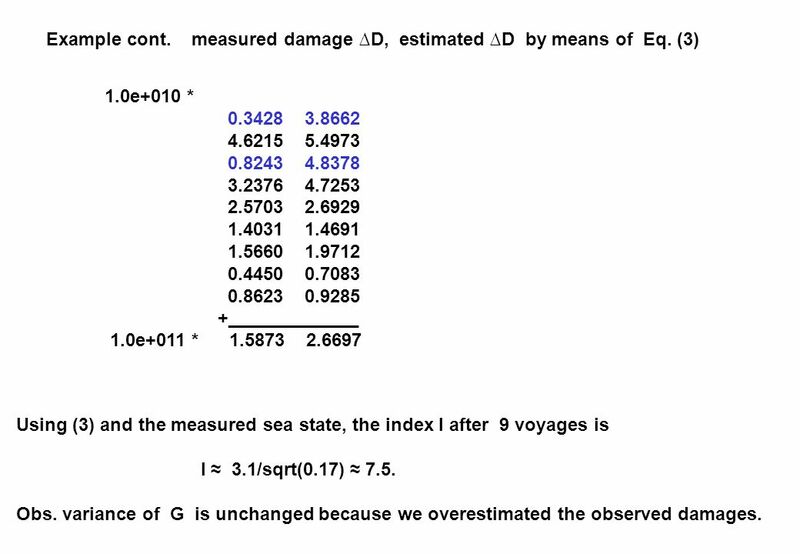 This can be done by means of statistics: Using observed damages for 4 winter passages, 2 summer and 3 spring /fall, one can estimate ∑ E[∆Dj] and CoV(∑ ∆Dj)^2 by estimating average damage and its variance for the 3 seasons. 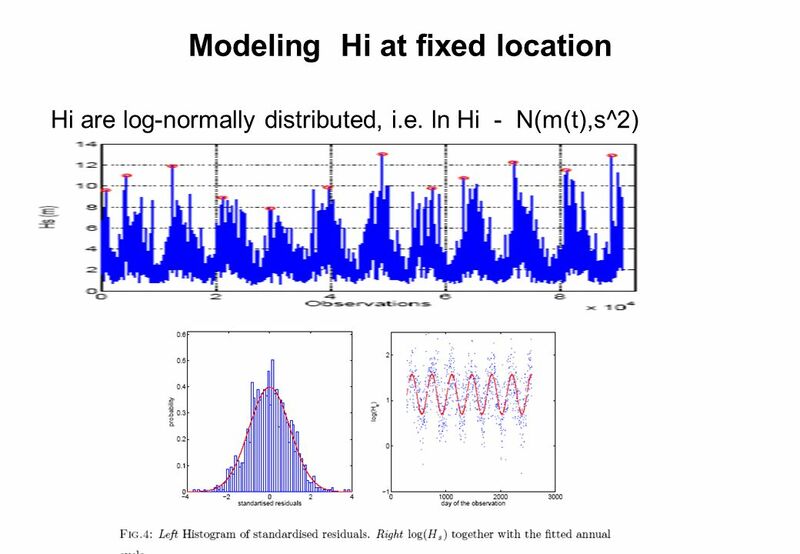 The estimates are: E[∆Dj] ≈ 10^10 * [3.17 0.73 1.34] V[∆Dj)] ≈ 10^20 * [3.59 0.11 0.67] Hence, neglecting statistical errors, by (2), I ≈ 1.76/sqrt(0.175) = 3.0, (CoV(∑ ∆Dj)^2=0.005 ) Ship is not safe enough to sail in the following 2 years. 9 Example cont. 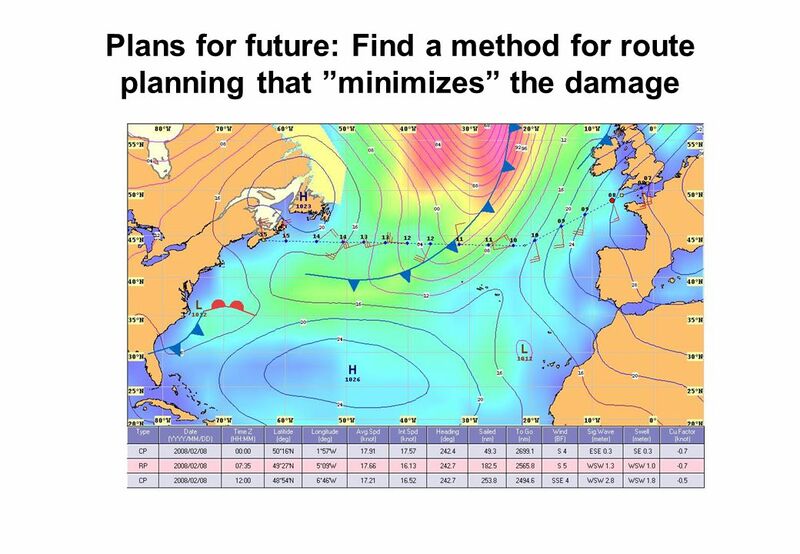 measured damage ∆D, estimated ∆D by means of Eq. (3) 1.0e+010 * 0.3428 3.8662 4.6215 5.4973 0.8243 4.8378 3.2376 4.7253 2.5703 2.6929 1.4031 1.4691 1.5660 1.9712 0.4450 0.7083 0.8623 0.9285 +_____________ 1.0e+011 * 1.5873 2.6697 Using (3) and the measured sea state, the index I after 9 voyages is I ≈ 3.1/sqrt(0.17) ≈ 7.5. Obs. 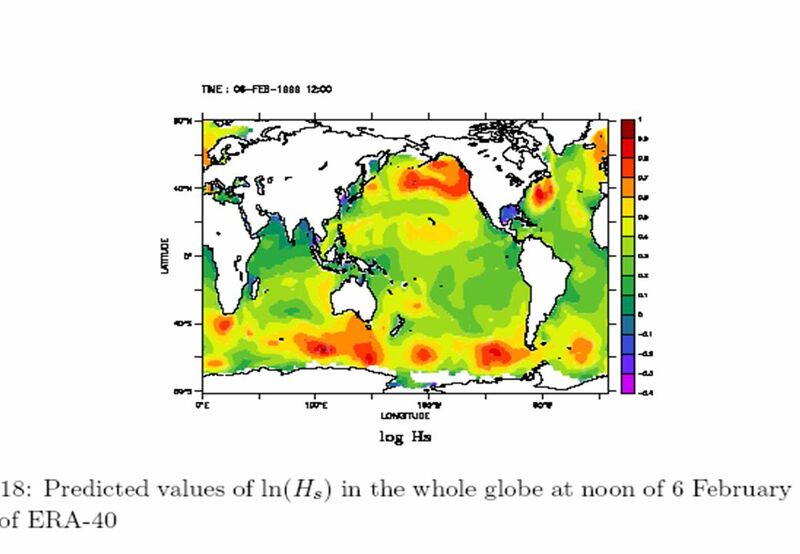 variance of G is unchanged because we overestimated the observed damages. 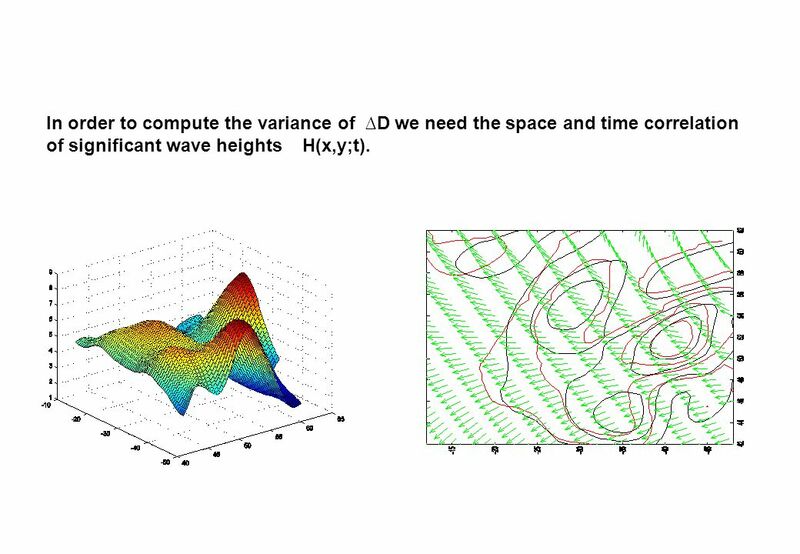 14 In order to compute the variance of ∆D we need the space and time correlation of significant wave heights H(x,y;t). 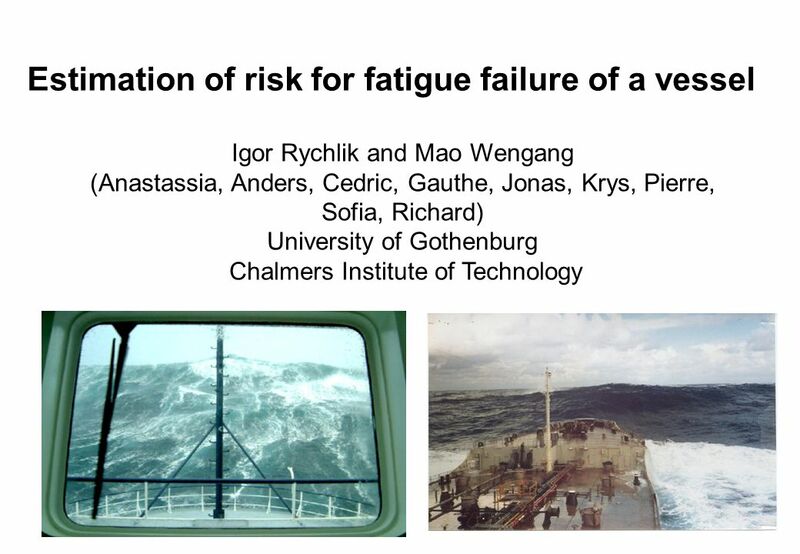 Download ppt "Igor Rychlik and Mao Wengang (Anastassia, Anders, Cedric, Gauthe, Jonas, Krys, Pierre, Sofia, Richard) University of Gothenburg Chalmers Institute of Technology." Experimental Methods MEC3045F Non-destructive evaluation. Part of the BRE Trust Protecting People, Property and the Planet What have fire doors ever done for us? Ian Stewart Certification scheme manager June 2014. Case study: sockets (1) Established within the GROWTH project GRD "Improvement of Service Life and Reliability of Cold Forging Tools with respect. 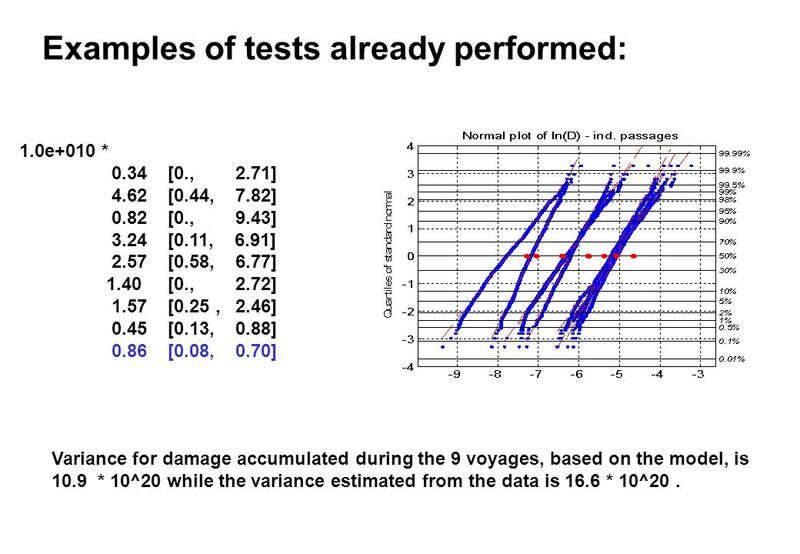 Technology & Engineering Division 1 IDR-IVC-ELM/VS Coils – July, 2010 ITER_D_3LDJVJ v1.0 FATIGUE CONSIDERATIONS FOR ITER IVC COILS Jun Feng INTERIM. Jacob E. Hiller Graduate Student at the University of Illinois at Urbana-Champaign Faculty Advisor: Dr. Jeffery Roesler Concrete pavements in California. 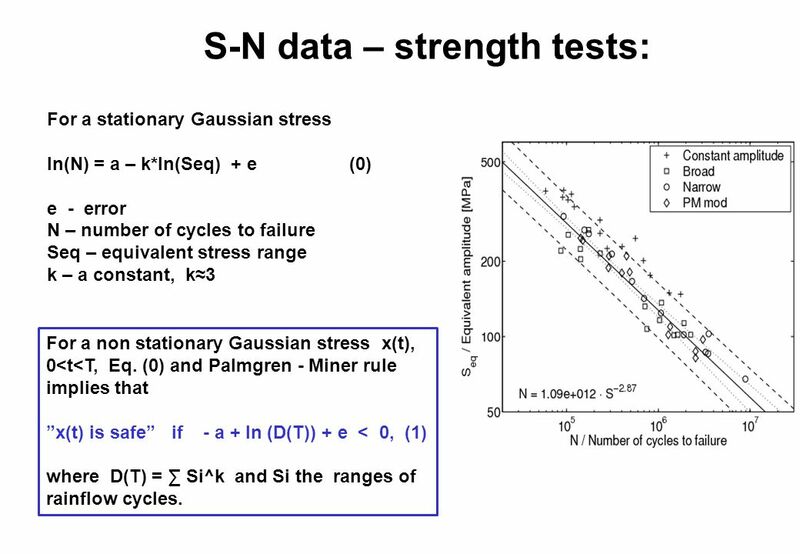 Modelling unknown errors as random variables Thomas Svensson, SP Technical Research Institute of Sweden, a statistician working with Chalmers and FCC in. Fork Inspection & Maintenance TM. Fork Inspection & Maintenance Forks are a critical part of the everyday operation of lift trucks. The stresses, strains. New Zealand Performance Based Chip Seal Bitumen Specification Opus Research Austroads Workshop 4 December 2014. Challenge the future Delft University of Technology Blade Load Estimations by a Load Database for an Implementation in SCADA Systems Master Thesis. Case study: tripods and cross-joints (1) Established within the GROWTH project GRD "Improvement of Service Life and Reliability of Cold Forging. Replacing Arch Beams: Your Plant’s Safety Depends On It! Yard. Doç. 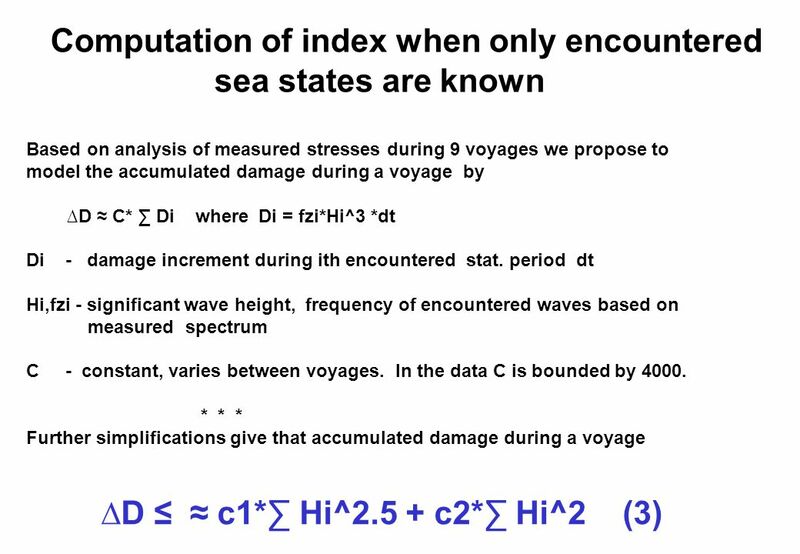 Dr. Tarkan Erdik Regression analysis - Week 12 1. 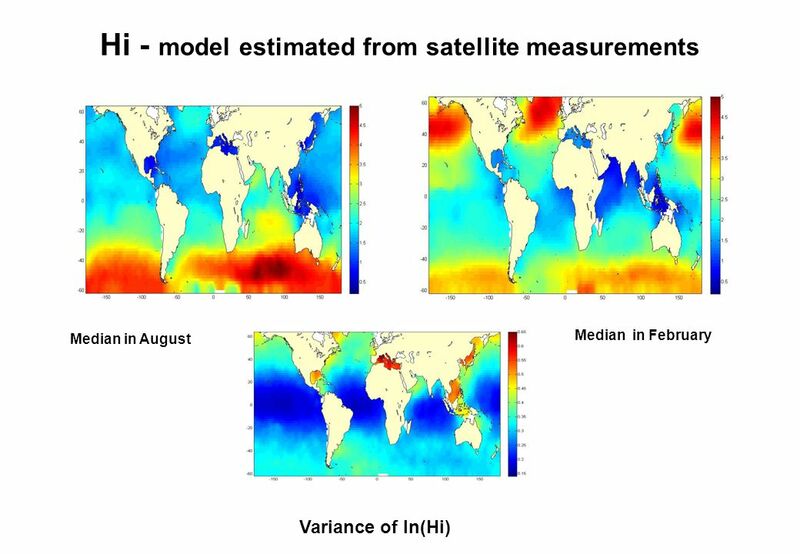 On-board reassessment of sea conditions for marine operations by Christophe Capitant (presented by Christophe Maisondieu) PrISM_MSEM System. Analysis of Shaken Baby Syndrome MRI-SCANSPRO-ENGINEERHYPERMESHFEM MODEL LS-DYNAPOST PROCESSING To perform computational simulations repeated shakings. Adaptive Rao-Blackwellized Particle Filter and It’s Evaluation for Tracking in Surveillance Xinyu Xu and Baoxin Li, Senior Member, IEEE. Extrapolation of Fatigue Loads 4th Conference on Extreme Value Analysis Gothenburg, August 15-19, 2005 Pär Johannesson Göteborg, Sweden August 16, 2005. 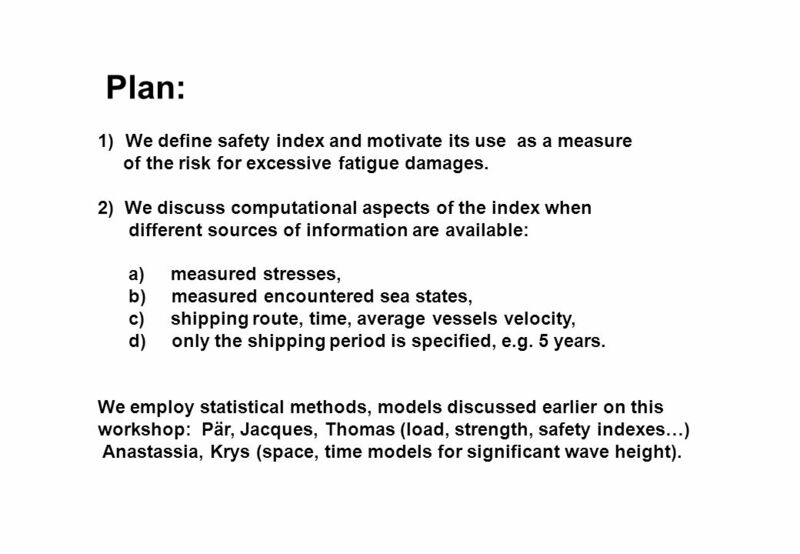 OrcaFlex OrcaFlex User Group, 2004 www.orcina.com Slide 1 of 5 - Fatigue Analysis Automated Analysis from Multiple Simulation Files Analysis Options: –Regular.